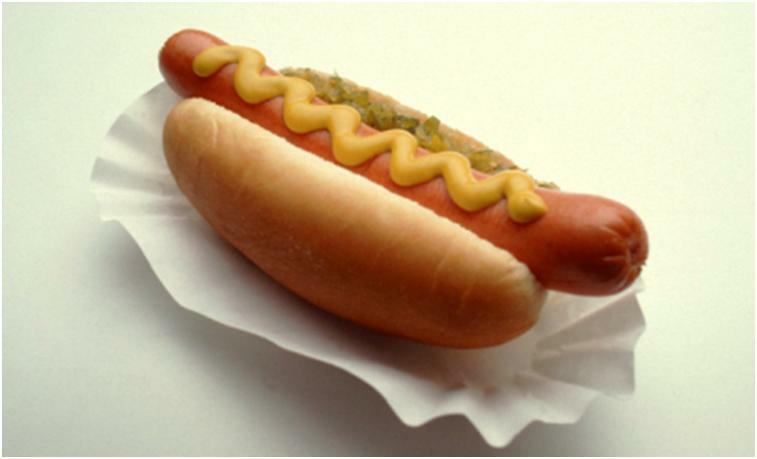 At its most basic level, the hot dog is a sausage served in a sliced bun. In the American “culinary” vernacular it is most often garnished with mustard, ketchup, onions, mayonnaise, relish, cheese, chili and/or sauerkraut. 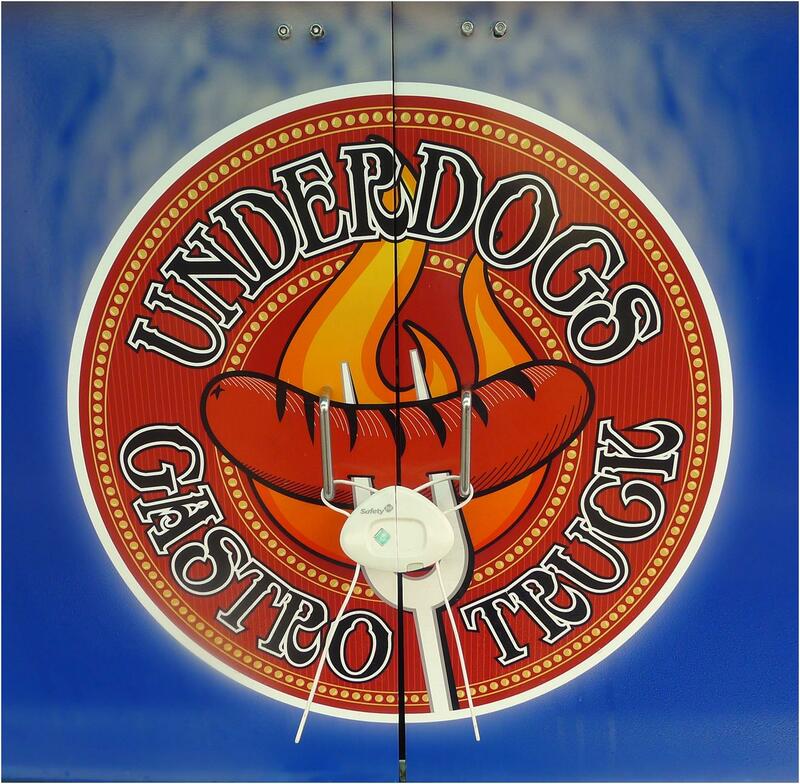 The Underdogs Gastro Truck is not about the hot dog at its most basic level. In fact, its name notwithstanding, it’s not really about the hot dog at all. What it is about is the sausage in all its glory. Nearly every culture and ethnicity has its own way of offering meat in tubular form (as Tony Bourdain might say). The Underdogs Gastro Truck is dedicated to the exploration and exploitation of many of those – and some more of their own creation – in all sorts of different ways. After a debut that delayed by a collapsed loan deal before being kickstarted by a YouTube video, Underdogs hit the street in late June, 2012. We visited five months later. On our visit, Underdogs’ menu offered nods to Greece, Germany and those far off foreign lands, Memphis and Buffalo as well as some more fanciful and abstract offerings. Given that this was our first trip to Underdogs we stuck to their slightly more traditional offerings based on the conviction that the sausage was, fundamentally, where it was at. 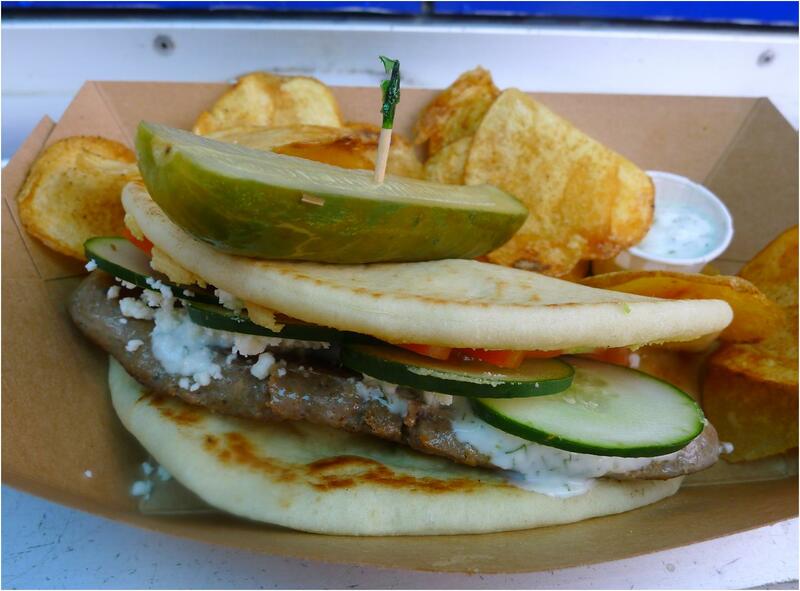 One great example of what Underdogs Gastro Truck brings to the table – or, more accurately, the streets – is it’s “Freak the Greek” dish, a lamb sausage and pita dish with tsatski sauce, fresh cucumbers and tomatoes. It is, as my friend Rob Colosia described it, not unlike a three dimensional gyros sandwich. Instead of the thinly sliced pressed lamb of the gyros, this dish offers a thick, toothsome sausage. It is not, though, a competitor to the gyros sandwich as a testament to the scope of what sausages can achieve. What this sausage achieved was the essence of perfectly seasoned lamb with its deep savory flavors and meaty accessibility. 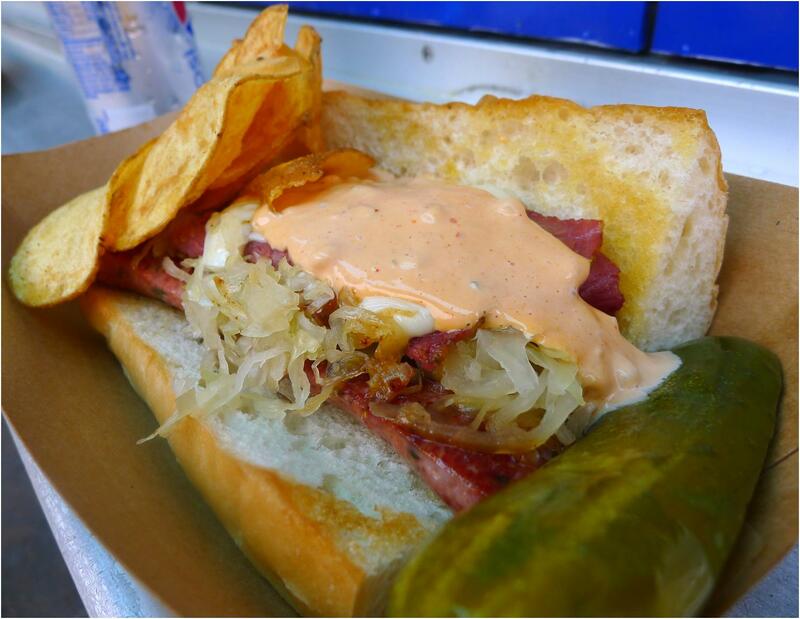 For my lunch I ordered the German Shephard, featuring a traditional onion sausage, some pastrami, sauerkraut and swiss cheese. The sausage itself could not have been better. It had a full-on porky sausage flavor with additional sweetness supplied by the onions. The overall impression was a deep and satisfying roundness. While Rob was worried the pastrami might overbalance the sausage it did not do so. It provided just the right accent. In fact, all of the elements worked well together. The key flaw in flavor balance was the Thousand Island dressing. There was, not to put too fine a point on it, too much of the stuff. The flavor of the dressing worked very well with the other ingredients. It was, in fact, the perfect balance to the kraut. But there was just too much of it. A bit less would have been so much more. If I had a single criticism of what Underdogs does in general (at least insofar as I’ve seen it given my limited exposure) it would be inattention to the bread component. As a truck in the sandwich business they are, whether they want to be or not, in the bread business. Both of the dishes we saw “featured” bread bits that were, sadly, afterthoughts. The pita bread was, essentially, untreated and fresh from the market. The grilling of the bread on the German Shephard was something of an annoying afterthrought. In truth, these criticisms are something of an exercise in nitpicking. Underdogs is a truck with a clear vision of what they’re trying to do and an equally clear conviction as to how to accomplish it….and the food they put out tastes really good. The truck’s eclectic approach is exactly the opposite of a weakness. It is what the place is about. 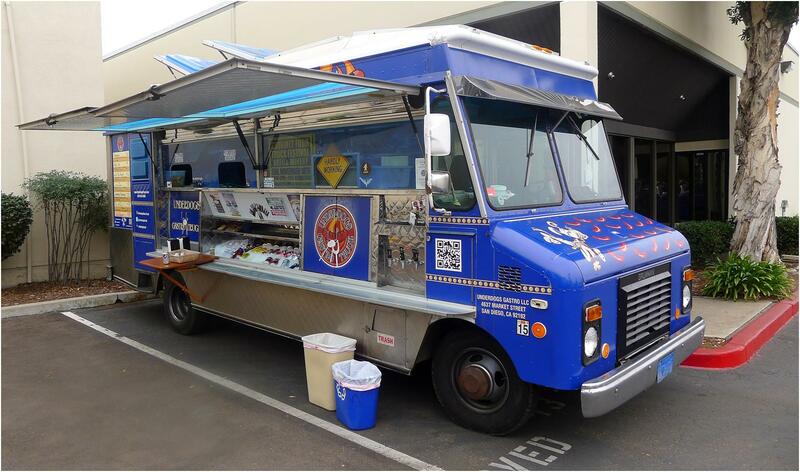 If you want to track down the Super Q Food Truck for yourself you can find them here: http://underdogstruck.com/ (a website that is little more than a placeholder), http://underdogstruck.tumblr.com/, https://twitter.com/Underdogstruck, and http://www.facebook.com/UnderdogsGastroTruck?ref=ts&fref=ts.